Surveyors anticipate market activity to increase over the next three years Monday 25th May 2015. A new SCSI/Teagasc report on the land market shows a complex picture in terms of agricultural land prices movements in Ireland in 2014. In parts of the country where dairy production is more prevalent, such as South Leinster and Munster, agricultural land prices mainly increased in 2014. By contrast, in the Connaught/ Ulster region where dairying is less prevalent and dry stock farming predominates, agricultural land prices generally fell in 2014. The land report, which was compiled by the Society of Chartered Surveyors Ireland (SCSI) and agricultural economists at Teagasc, points to considerable variation in price growth across the country during 2014, with land around Dublin experiencing much stronger rates of increase. The report shows that prices for agricultural land transactions, up to 50 acres, increased by more in Leinster than in Munster, while prices generally fell in Connaught/Ulster in 2014. This pattern of price movements was generally mirrored for sales transactions involving larger areas of land. Combining the results of this year’s survey with those of earlier years, reveals a growing divergence in land values in the South and East of the country in comparison with the North and West. The average price of agricultural land of up to 50 acres with residential holdings and entitlements in the Rest of Leinster region was €11,947, an increase of 7% on 2013. In Munster, it was €11,608, up by just 2%. 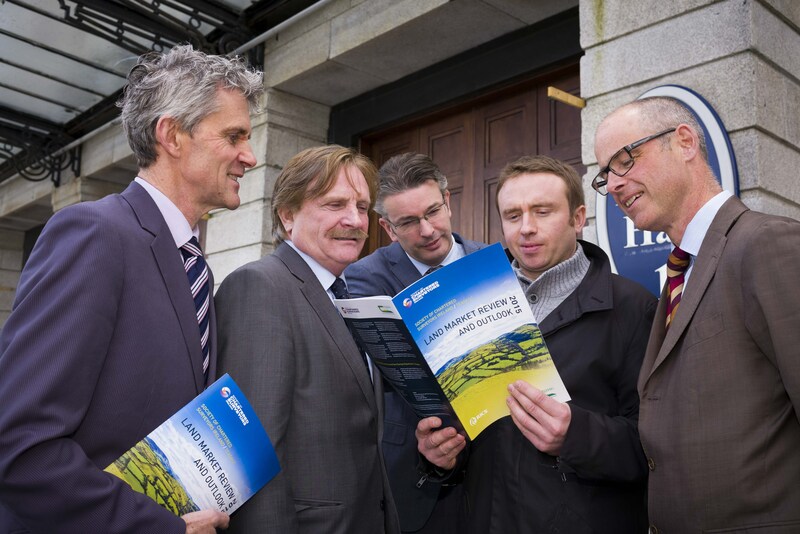 The report, which also covers the land rental market, showed an across the board increase in prices for grazing land in 2014, with the strongest increases being recorded in the Munster region. Rental prices for tillage land also increased with the strongest increases again being recorded in Munster. With rents in Munster increasing by between 12% and 18%, this has resulted in a further widening of the gap between rents in this region compared to other parts of the country. Taking an international perspective, the report notes that in spite of the fact that Irish land sales prices are still well below their 2007 peak, agricultural land in Ireland remains expensive when compared with land prices in much of Northern Europe. The report also highlights the recent measures taken by Government to promote longer term leasing and provides some evidence of an increasing trend towards longer rental durations. The report notes that, in aggregate, agricultural incomes are likely to be lower in Ireland in 2015, largely due to the fall in milk prices, with a recovery of income to follow in 2016. Stephen Kavanagh, Chairman of the Society of Chartered Surveyors Ireland (SCSI) Rural Professional Group said; “SCSI rural chartered surveyor members surveyed were generally upbeat about the medium-term outlook for the market, with 62% of those surveyed expecting the demand for agricultural land to increase during the next three years. However, only 38% were expecting supply to increase and the lack of mobility in the market remains an issue. Members generally expect that rents will continue to increase into 2015, with an average growth rate of 7% estimated for the first three months of 2015 alone”. Stephen Kavanagh also notes the difficulties facing farmers in accessing finance which is still an issue. “Although the economic recovery continues in the larger cities, we are still not seeing the effects in rural Ireland and we must ensure that provincial Ireland is not left behind”, he concluded.